November 28, 2018, Petaluma—Santa Rosa Junior College (SRJC) will host the Petaluma Student Research Conference on Thursday, December 6, 2:00-5:00 p.m. at the Petaluma campus Physical Fitness Center gymnasium. Students will present academic posters on both original research and literature reviews on a variety of topics, highlighting students’ research efforts and giving them early exposure to professional conference presentations. 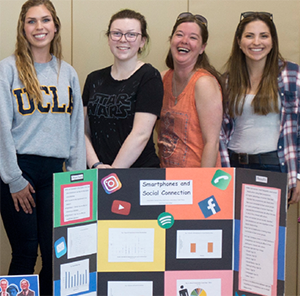 The event is sponsored by faculty members Erin Sullivan in psychology and AC Panella in communications studies, along with students in various areas of study, including communication, psychology, sociology, and others. The conference is an interdisciplinary effort to promote student research, writing, and presentation skills. It encourages student learning in the areas of communication, critical analysis, and intercultural literacy and interaction. Top research projects will receive scholarships for their work, generously donated by SRJC Foundation board member Dr. Doug Garrison. The faculty who have worked on the conference said that it is beneficial to students in many ways. "This is a great opportunity to have students see their work come alive outside of the classroom,” Panella said. "It is wonderful to see students thrive as they share their research accomplishments at the Petaluma Student Research Conference," Sullivan said.